2018 marks 51 years since the occupation of the Palestinian Territory and 11 years of the Gaza blockade. Both the occupation and the blockade affect every aspect of life for Palestinians – they dictate where they can live and study, and whom they can marry. The blockade has devastated Gaza’s economy, caused widespread destruction and left most people largely cut off from the outside world. Today, one million Palestinians in Gaza don't have enough food to feed their families, despite receiving food assistance or other forms of support. Tougher restrictions for accessing Gaza via Kerem Shalom, the main commercial crossing. As a consequence, really limited amount of fuel and cooking gas reaches hospitals, homes and business. Fishing zone reduced from 6 to 3 nautical miles (preventing fishermen from accessing 85% of the fishing waters agreed under the Oslo Accords). 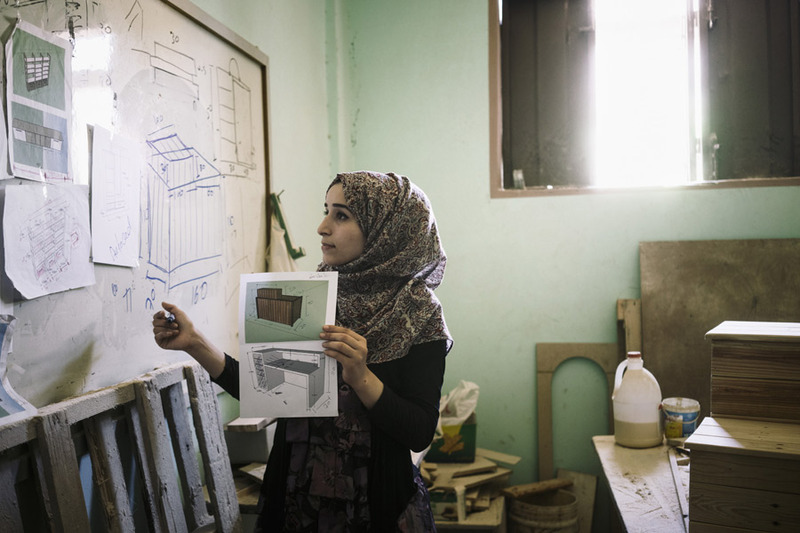 Aya, 27 years old, architect and designer - Innovation despite the blockade. The lack of job opportunities and scarcity of resources caused by the blockade forced Aya to look for a sustainable solution where she can use her skills and build a business. She opened a carpentry workshop and developed an environmentally friendly method to create furniture by recycling used wood pallets. Gaza is entering its 10th year of blockade. It has crippled its economic growth and the freedom of 1.8 million Palestinians living in the Strip. 80 per cent of the population rely on international humanitarian aid to survive. Oxfam calls on all parties to the conflict to not allow another escalation in violence, to agree to a lasting ceasefire and an urgent end to the blockade. Oxfam, in partnership with the World Food Program, helps more than 71,000 people to access basic food items through an electronic voucher system. Oxfam also supports farmers and food processing enterprises through economic development projects. Gaza’s electricity crisis worsened in 2014 after the major power plant was destroyed in the war. The crisis was tragically highlighted in 2016 when three small children were killed after the candle they were using set their bedroom alight. Palestinian kid, Sehed Saad Abu Hasna wounded by Israeli strikes on a refugee camp in Jebalia, taken to Kamal Adwan hospital in Beit Lahia, Gaza on July 30, 2014. An entire generation of children in Gaza is growing up like Sehed - knowing little but airstrikes and destruction. The UN estimates that at least 360,000 children in Gaza will need psychosocial support to try and overcome the trauma. Adnan "We are a family of 10 living in Gaza Strip. Our house was surrounded by Israeli tanks and soldiers during the 2008-2009 military operation and we had to flee. In Gaza, Israel’s occupation includes a 10-year land, air and sea blockade that has trapped almost two million people inside the 60-kilometre wall, isolating and depriving them of their rights. Israel’s blockade of Gaza keeps people poor and denies them their rights. We are calling on all parties to the conflict to not allow another escalation in violence, to agree to a lasting ceasefire and an urgent end to the blockade.